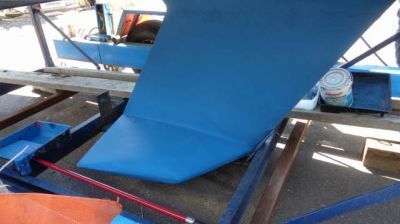 CONSTRUCTION: White fibreglass hull with blue boottop and cove stripe; blue bottom paint. 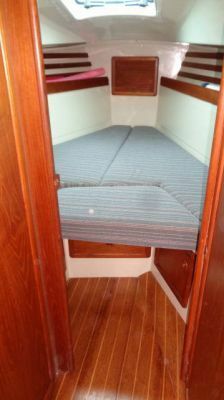 The 11'8" beam is carried well aft and it offers both good form stability and a generous interior. 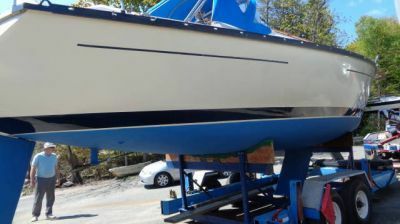 Perry is a known for designing functional, good-looking cruising boats. 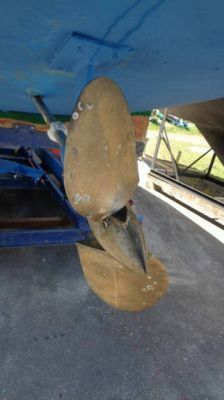 She has a solid glass hull and a cored deck; wing "Hydro Keel' lead keel; spade rudder; BIMINI TOP, DODGER; Whitlock wheel steering; double lifelines (2016) with bow and stern pulpits; 3 opening ports; two hatches. 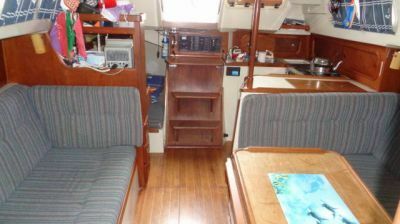 ACCOMMODATIONS: Large V-berth stateroom forward w/ storage shelves outboard; enclosed head to port with a Jabsco marine toilet connected to a 15 gallon holding tank via a 'Y' valve; sink with pressure water and vanity and shower; hanging locker opposite to starboard. 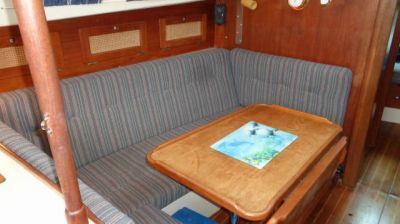 Main salon features at settee to starboard and a U-shaped dinette to port with a drop-leaf table which drops to make a double berth. 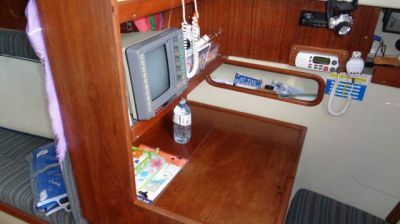 Quarter-berth aft to starboard with a forward facing chart table. 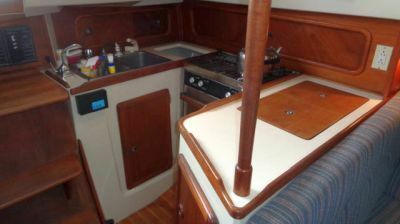 The U-shaped galley is to port and it features a 2 burner Hillerange stainless steel propane stove with oven; large ice box; twin stainless steel sinks with pressure water; and plenty of counter space and dry storage. 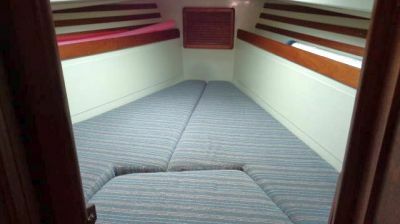 40 gallon water tank capacity in two tanks port and starboard under the settees; stainless steel hot water tank; Teak and Holly Sole; solid teak trim; blue/gray fabric upholstery; blue draperies and fibreglass headliner. 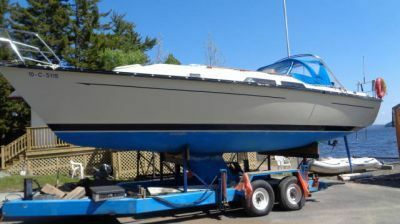 ENGINE: 1989 Volvo Penta 2000 series, 3 cylinder, 28hp, cylinder Diesel Inboard; fresh-water cooling; fixed 2 blade Max Prop feathering propeller; 20 Gallon Fuel Tank; Alternator; tachometer. 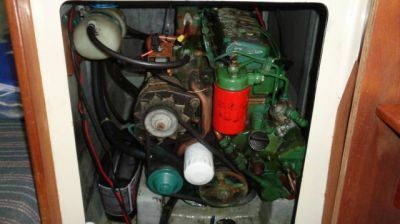 ELECTRICAL SYSTEMS: The yacht has both a 12 volt DC and 110 volt AC systems. The former is supplied by an alternator on the engine through a selector switch to 2 lead/acid - 12 Volt batteries (2016); The 110 volt system is supplied by a 2,000 watt inverter; optional shore-power connection; polarity indicator; 50' - 30 amp cord; 3 interior receptacles. The yacht has a full complement of interior and navigation lights. 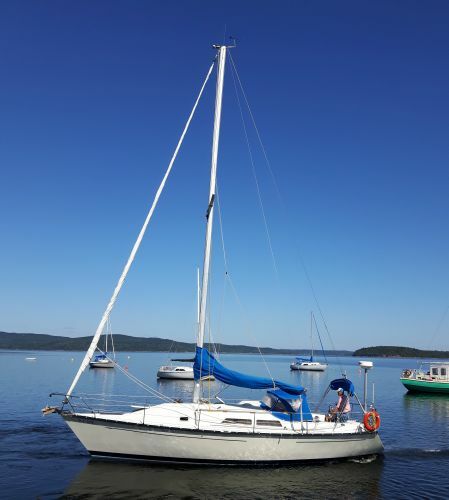 SAILS &RIGGING: Mainsail; blue sail cover; 140% Genoa w/ recent UV cover; 110% jib; asymmetrical spinnaker w/ suffer; aluminum mast and boom; stainless steel standing rigging; winches by Lewmar: 2 X #43 self-tailing, two-speed primary sheet winches; 2 X #8 halyard winches on the cabin-top; Lewmar main-sheet traveller on the bridge-deck; Harken roller furling gear. ELECTRONICS: Standard Horizon 'Intrepid' VHF w. Ram Mic & DSC; Raymarine RADAR; Garmin #400 GPS/ plotter; Raymarine ST50 depth sounder; magnetic compass on wheel pedestal; Raymarine ST 4000 Autopilot ; Kenwood CD stereo. GENERAL: Bow roller; anchor well; Delta and 20H Danforth anchors; 2 X 300' anchor rodes; engine & equipment manuals; Life Sling; boat hook; fenders & dock-lines; cockpit table; stainless steel swim ladder; barbeque; steel cradle; manual and electric bilge pumps; 3 fire extinguishers; radar reflector; cockpit cushions; clock & barometer; kerosene lamp. 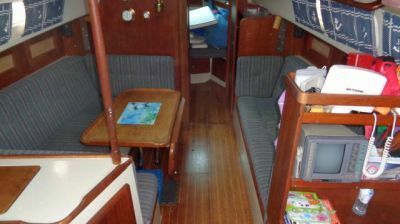 BROKER'S COMMENT::"This is a very roomy and popular mid-sized cruiser that has been well maintained and upgraded. 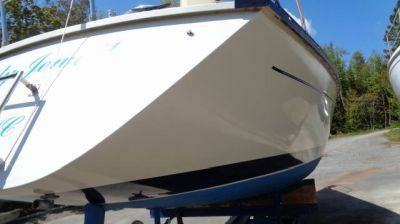 This boat is one of the last Mirage 35s built; and one of the few with the innovative 'Hydro-Keel', shoal draft wing keel.